Mum did almost all the cooking in our house when I was growing up. Dad was (is) a self-employed building contractor who generally came home from long days on site to spend evenings doing paperwork in his home office. Dad did have a few specialties that were almost always his responsibility on weekends and in the mornings. Besides the usual masculine culinary domains (summer barbecuing and fish-smoking), I remember that Dad always took charge of two staple dishes at home: poaching eggs and preparing porridge. Both dishes are deceptively simple, but Dad has his techniques finely honed. In fact I have yet to match his skill at poaching eggs, and my slap-dash approach to porridge does fail to hit the mark on occasion. 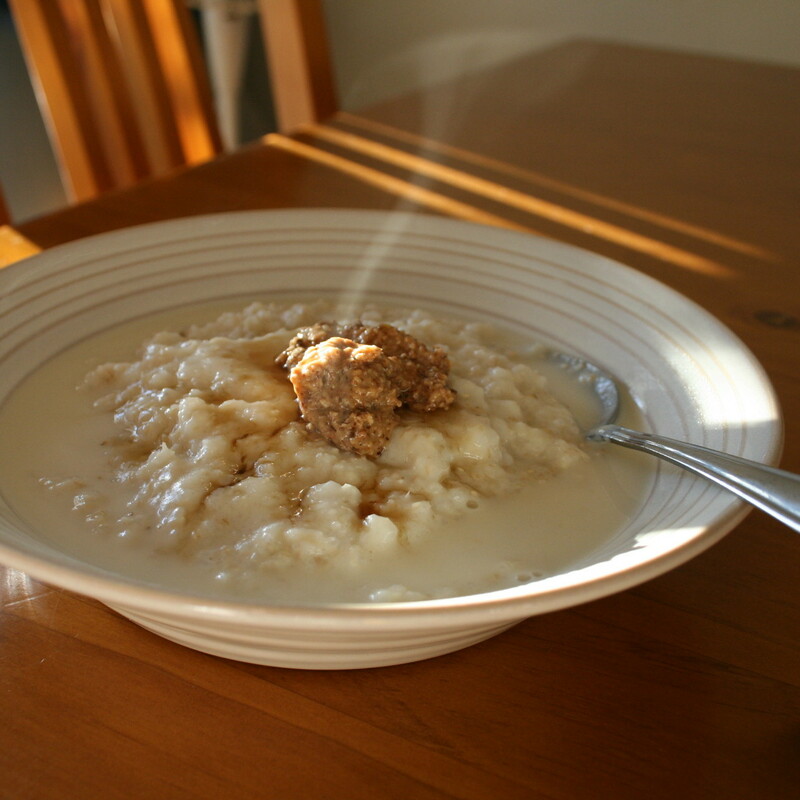 Dad’s porridge was always reliably creamy, and I ate it almost every morning as a child, sprinkled generously with brown sugar, wheat germ, and Sanitarium bran flakes. Sometimes I would stir the whole lot together; other times I would retain the layers, carefully working my spoon around the edges of the plate, chasing the diminishing ring of milk. I’ve been craving simple and nourishing foods lately. Although the winter is still far from chilly I’ve been under the weather a fair bit and a warm and soothing start to the day just feels right. 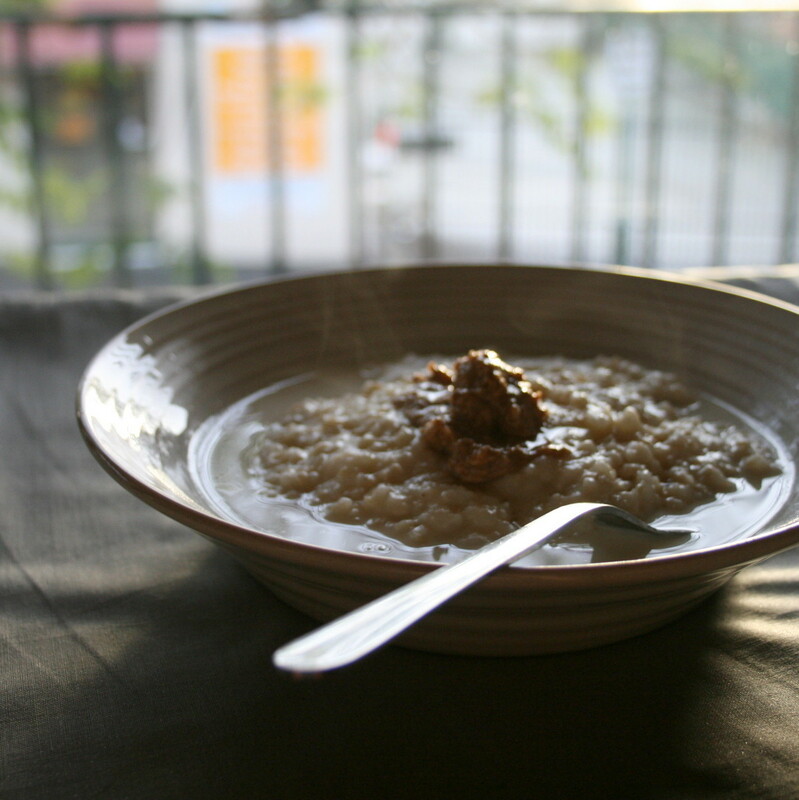 Porridge is synonymous with rolled oats, although it technically refers to the process of boiling any cereal grain in water or milk. These days I tend to make porridge from brown rice and it still surprises me how many turned-up noses I get in response to this. It seems that most people see rice as a savoury accompaniment, to which I protest “think rice pudding!”, usually to no avail. People also find it difficult to understand why I tend to dump a heaped teaspoonful of almond butter on the top, a practice that is construed as completely weird. Maybe it’s just that I have tampered with a classic dish and that all would be well if I referred to my brown rice breakfast by some other name – “rice-mash” perhaps? “Sweet rice soup”? Whatever the case, I love it because like its rolled oat counterpart, it manages to be rib-sticking yet light, comforting yet bracingly healthy. This recipe originates from my strict dairy-free days so I make mine with rice milk (there goes another faux pas), but I imagine that cow’s milk also works fine. I always make it with short-grain brown rice that has been well-cooked, and by this I mean that the kernels have become sticky and are just starting to lose their structural integrity (a rice cooker is best). Don’t be tempted to make this with white rice; it’s the nuttiness and substance of brown rice that are essential here. Blend rice and milk together until incorporated but still textured. Adjust the amount of milk as desired. I prefer a thick-ish porridge, so 1/2 a cup is usually fine. I find that a stick blender does the job, but ensure that you use a jug that is deep enough, as believe me when I say that spraying half your porridge up the kitchen wall is not the best start to your day. I blend my rice in a Pyrex jug, but if multiplying the quantities to feed several people, then a bench-top blender or food processor would probably be the best option. Heat the rice in a small saucepan for a few minutes or in the microwave for about a minute and a half, adding some frozen blueberries if desired. Transfer the heated rice to a bowl and top with maple syrup and almond butter, or other more conventional toppings if these seem too bizarre. I really do encourage you though, to give these suggestions a try – the almond butter provides richness and ups the protein content, while the maple syrup is just plain delicious. Eat on your balcony if it’s a sunny morning; back in your bed if it’s grey.